Essential Adult Care Services was founded on the principles of helping others to maintain their independence and enjoy the quality of life that we all desire through providing experienced and trusted companions and caregivers that will exceed expectations while assisting with a wide array of activities of daily living. Essential Adult Care Services is large enough to serve your wants and needs, while not too big that you know that you’re being thought of and cared for like family. Regardless of place or time, we are always here for you! At Essential Adult Care Services, our mission is to create a balanced environment of both physical and emotional well-being for our team members, clients and their families. You can rest assured that our caregivers have all been screened thoroughly. We do a Level 2 background screening, verify all licenses and certificates (including driver’s license and car insurance) and check all references. Speaking of references, that’s exactly how we find out caregivers. We do not place help wanted advertisements. Each and every one of our caregivers has been referred to us!! At Essential Adult Care Services, we treat our caregivers like family and they in turn share and pass this culture along to our clients. To best serve our clients, we complete an assessment and require a client profile be completed and returned to us so that we have the ability to know and serve each client based on their individual likes, wants and needs. You can also expect both a friendly and familiar face. 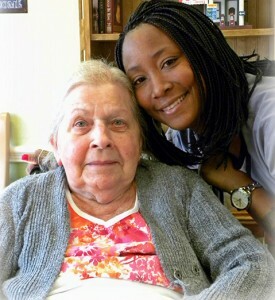 We strive to staff the same caregivers with the same clients. This continuity results in a stronger relationship and a higher level of care due to familiarity. If you are seeking to hire us to care for your loved one, it’s our pleasure to provide you with client case reports so that you’re kept up-to-date and aware. We’re positive that you’ll love our caregivers and confident that you will enjoy your experience with our administrative staff. We sincerely appreciate and value you’re business and are available to you 24 hours a day, 7 days a week, 365 days a year…call us anytime!